One of the first full games released for download on the DSi, Mario Vs. Donkey Kong: Minis March Again isn't the slight diversion it first appears to be. One could look at Mario Vs. Donkey Kong: Minis March Again as a fun third iteration of Nintendo's take on the Lemmings series. But you could also look at it — one of the first download-only portable games developed and distributed by the gaming giant Nintendo — as an adjuster of expectations for the quality and heft of the content we should expect from our portable downloadable games in this era of iPhone App avalanche. How much would Nintendo give you for eight bucks? This game's an answer. Smarter Than A Brain-Aged Brain Maybe Prof. Kawashima's math problems make some people feel smarter, but there are those of us in the world who feel crafty only by figuring out how to get a few Mario-shaped wind-up toys to walk up the right paths, avoid the wrong pitfalls, dart over properly-drawn bridges of pink blocks etched into the level by our hand and exit the level safely. Each level plays in flat 2D, with the mini-Marios on unstoppable auto-pilot (a change since the previous installment of the series, when you could tap them to halt their march). Getting the mini-Marios (or mini-[spoiler deleted for you] past enemies, over barriers and safely home is seldom a sweat in the game's first half but becomes wickedly challenging in the latter levels, especially as the game introduces new time pressures. 240 Bites At first the game appears to have 40 levels, including recycled boss battles from the first Mario Vs DK game on the DS. Then you figure out it has 60. But actually it has 100. And, using the system's level editor you can either make and save 140 more or download that many from an easily accessible free store that already has plenty of ranked user-made levels and a batch of extra ones from Nintendo. That's a lot of content and it grants you a lot of re-play value. Shopping Confusion Nintendo's offering here may shame that of many iPhone developers but Nintendo has some explaining to about its own missteps. First, this game not only needs a demo, but it already has one that isn't being offered properly. I'm referring to an oddly-named Guest mode that allows people to borrow your DS and try a few levels without messing with your save file. Why that Guest mode version of the game isn't offered as a free download through the DSi online shop is a mystery. Second, people who go into the DSiWare shop to download this game will see a warning that this game includes some material recycled from Mario Vs. Donkey Kong 2. What material? Nintendo hasn't made that clear, but we've spotted repeat boss levels. The main game levels seem to be new, but having not played Mario Vs. DK 2 exhaustively we don't know for sure and will update this review if we find out that the content here is less original than assumed. For first-time consumers of this Mario franchise, Minis March Again is a good thinking-persons' pleasure and a welcome return for Nintendo's little-seen in-house U.S. development group NST. There's a lot of good puzzle gaming here. It's just too bad that it's hard to tell how new it all is. 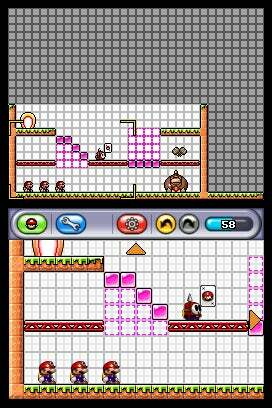 Mario Vs. Donkey Kong: Minis March Again was developed by Nintendo's NST group and published exclusively for download on the Nintendo DSi. Released on June 8th. Retails for 800 Nintendo Points ($8). Played through the game's 40 campaign levels, 17 post-"ending" levels and four that I downloaded.